Eventmasters entered their first ever team in the recent Marbella Birmingham City Corporate Golf Day and remarkably gained a podium position with a gallant third place finish. 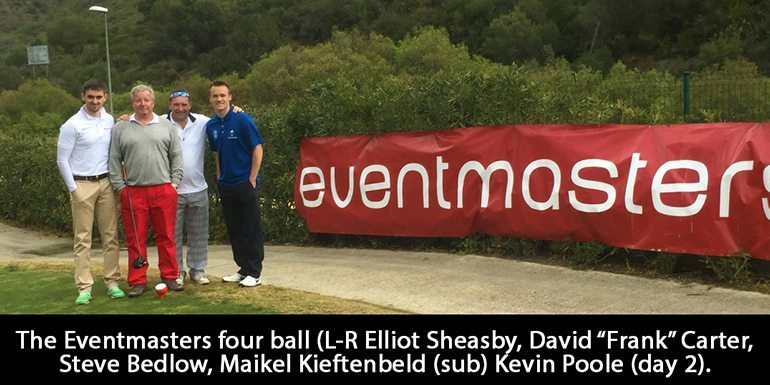 The event took place at the recently refurbished Hotel La Quinta Golf and Country Club, the competition was a four-ball better-ball and the Eventmasters team consisted of novice golfer Elliot Sheasby playing off 24, superstar golfer David ‘Frank’ Carter who put in a sterling performance despite going lame halfway through day two, Steve Bedlow the mainstay of our team – solid and we were joined by Birmingham City players and coaches – on each of the two days allocated with Maikel Kieftenbeld on day one and day two Kevin Poole. At the gala dinner we were delighted when our score resulted in a third place finish, new golf bags all around. Many thanks to Ady Wheatcroft from the Aspiration Group, who were the event organisers on behalf of Birmingham City; Ian Dutton and his commercial team at The Blues and Dominic O’Reilly from Eze Group who sponsored the whole event. Funds were raised throughout the event on behalf of Meningitis UK in particularly Liam Smiles and a great time was had by all.